Fatou and Alamnou live in the aforementioned village, a tiny assembling of mud houses thrown together in the scrubby Sahel of central Niger. I visit in the rainy season (previously), when the countrysiinundatedudated with still pools of water. Ghostly white egrets perch on half submerged trees, while in the distance tall camels slough there way through the muck. The latter, slow moving and giant, have something almost prehistoric about them in this context. I’m not used to seeing camels in a swamp. The desert is vibrant and green at this time of year, after the rains have parched the otherwise thirsty landscape. The desert here is cyclical, and follows a predictable schedule. Fatou plays an old blue guitar, chipped and dried, slightly bent. The extremes of weather are not easy on musical instruments. She plays a long session, moving seamlessly from one song to another, many covers of of Etran Finatawa whose music is renowned in this part of Niger. Fatou’s guitar playing is measured and calm, and while we record outside under the trees, it is music transformed by context and place. From the vantage of far away, from a computer screen, it is easy to imagine a singular Niger, even a singular Tuareg identity. But there are many lives and many ways of living. 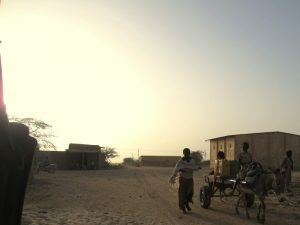 The village of Illighadad is a world apart from Agadez, from Niamey – both major cities in their own right, dense with people, noise, and the trappings of modernity. Fatou’s guitar speaks to a different pace. The days in Illighadad are long, and time is not measured by hours, meetings, or even by the muezzins prayer call – but by the suns passage, the movement of the animals, and the sound of the crickets. Fatou insists that she doesn’t just play guitar, but plays and performs tende as well (“better!”) with her cousin Alamnou, a renowned vocalist. 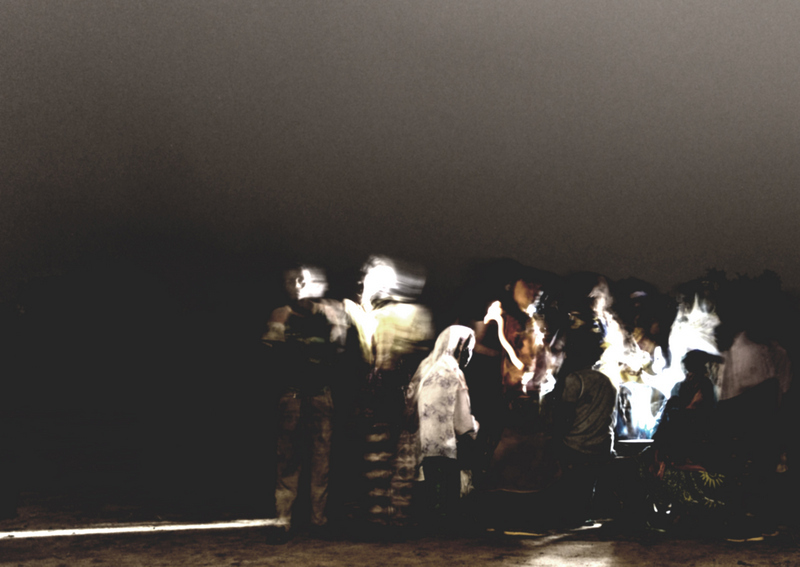 So at night, they assemble in the village. The “tende” is named for the drum, where two woman sit on pestles flanking a mortar, stretched with an animal skin. In a place with the absence of sound, no hum of electricity, no cars, no white noise, and no physical impediments, the tende travels far. As the village plays, people begin to come. You can see them in the distance, little lights dancing in the darkness, growing in intensity, from every direction, like fireflies drawn in from the night. Singers exchange the lead, backed by the chorus of Illighadad echoing in polyphonic harmonies, with staccato clapping, led by a deep and continuous thumping. We stay listening for hours, until the voices are weary of singing and the hands grow tired of the drums, and the crowd disperses through the darkness to find some sort of peace. While we had some original concept to meet Fatou and record her guitar, every night was accompanied by tende. In the end, we produced a recording with two sides – each unbroken sessions, representing the two sides of the music: the mellow guitar and personal expression of Fatou, and the cooperative and constant village music of the tende. Fatou’s guitar music is remarkable in some way because of identity. As one of only two Tuareg female guitarists in what is a male dominated genre, this was indeed my initial interest in coming to Illighadad. But Fatou exists far away from genre classifications. 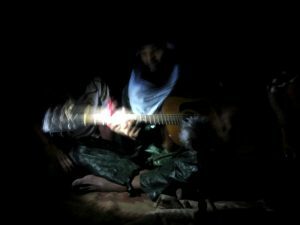 While she plays the guitar in the day, it is the tende at night – a reminder of the village music that inspired the guitar, and continues to do so. It reads to me as a suggestion that the two musics can and do exist simultaneously. And that different worlds may as well. 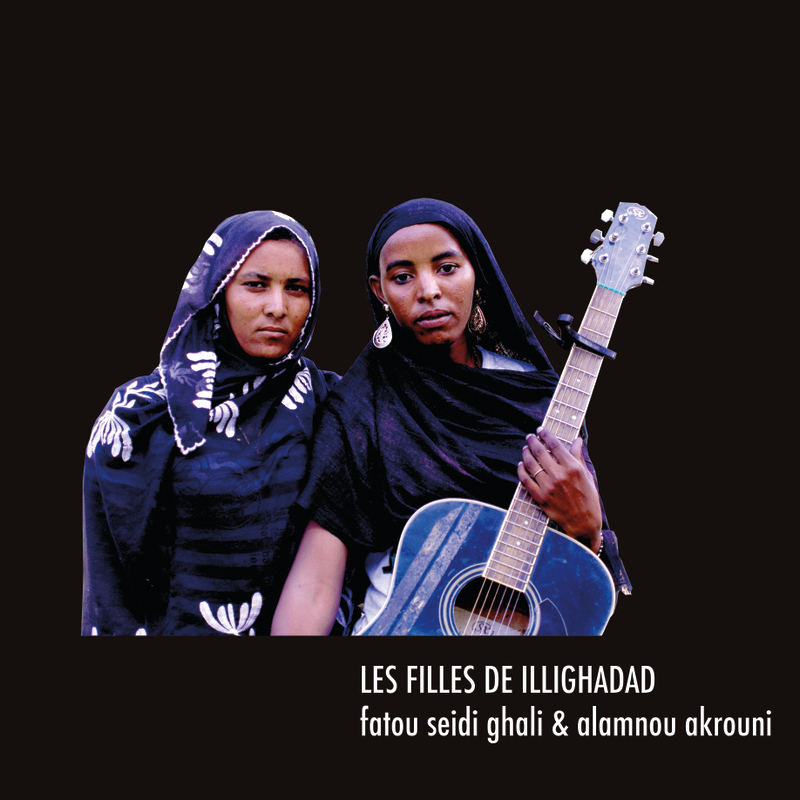 The new record from Les Filles de Illighadad is available from the shop on vinyl and via bandcamp. 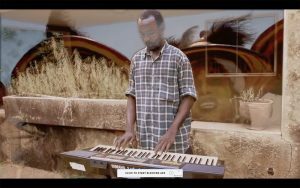 i love your Songs so much i wish you all the Best. I would like to interview you at the BBC. how long are you staying in London for? La BBC voudrait vous interviewer. pourriez vous venir dans nos studios a Londres?